You might think of President Obama or various TV shows when talking about the US, and different kinds of hamburgers, pizzas and microwave food in supermarkets when it comes to the American dishes. Although most American people do love this kind of simple diet, there’s got to be some special cuisine in this great land. Go feast yours eyes in the lines! America and Mexico are geographical neighbors, which is a significant factor that affects American’s cuisine, and Fajita is certainly a typical representative of Tex-Mex cuisine. “Fajita”, literally meaning “little belt” in Spanish, is the diaphragm of the rib, also known as the skirt steak, which was once be used as cowboys’ pay because the ranchers thought it was not that nutritional. 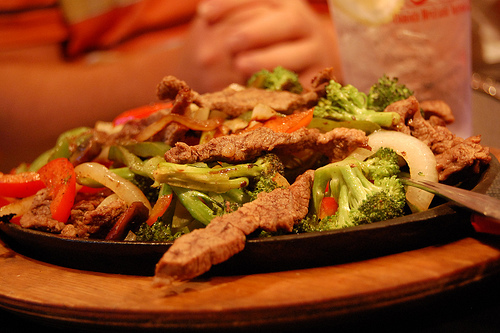 The cowboys, however, made full use of what they had and invented fajitas, which now becomes a part of the Tex-Mex dishes. Grilled skirt steak wrapped in tortilla, one bite, juicy, another bite, yummy, you can hardly stop from eating! Steak plays quite an important part in America’s food culture. There are steak houses everywhere, and many steak brands emerge due to the great demand, such as OMAHA STEAK, a famous brand in the US. Steak of top quality doesn’t need much seasoning. It tastes like heaven even though it is cooked in the simplest way. So which part of the beef tastes extremely fantastic? 1. Filet mignon, the tenderloin of the cattle, with its named originated from French, is the most expensive part of a cattle, because it contains less fat and tastes very tender, which makes it a good choice for girls who have desire for meat while afraid of getting fat. 2. New York Steak, boneless tenderloin, is a bit stringy and the fat is not that nicely distributed, but it is tender and juicy with great texture. 3. 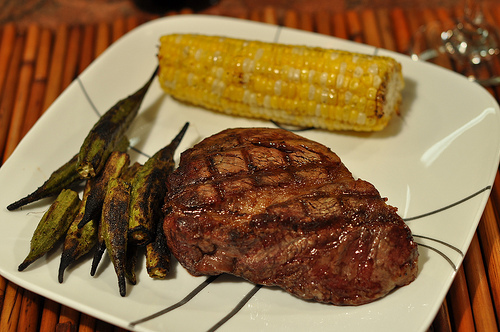 Sirloin is actually nicer part of the N.Y. Steak with better texture. In fact, steak doesn’t need much seasoning if you want to have the purest taste. When the pan is heated, put some vegetable oil or butter in it, and then the steak. High temperature can lock the juices of the meat. You can have your steak done whatever you like. Finally, seasoning a bit salt and adding some side dishes like broccoli, the original flavor of steak is ready to be served. —Sir (Miss), how do you like your steak (cooked)?